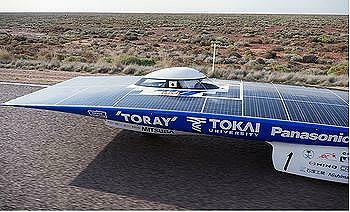 ADELAIDE, South Australia, October 20, 2011 (ENS) – The Tokai University solar car has won the Veolia World Solar Challenge, making the 3,000 kilometer run through central Australia from Darwin to Adelaide in four days. Less than 30 minutes separated the Tokai team from the second place car, the Nuon team from The Netherlands, after one of the closest last days in the history of the race. Running third, the University of Michigan team is some 100 kilometers behind. In Darwin on Sunday, 37 teams from universities and colleges around the world pulled their solar cars up to the starting line. The race drew cars from Australia, India, Canada, Germany, the UK, Belgium, Italy, Iran, Taiwan, Singapore, Saudi Arabia, Japan, Taiwan, South Korea, Chile, and three teams from Turkey. Under cloudy skies in Adelaide, the cars are coming in to Angle Vale near the corner of St. Kilda Road and Port Wakefield Road and then to the Ceremonial Finish and celebrations at Victoria Square. The race was disrupted by bushfires that officials believe were deliberately set. The flames charred 4,200 square kilometers on Monday and halted many of the solar teams as police closed a stretch of the Stuart Highway. 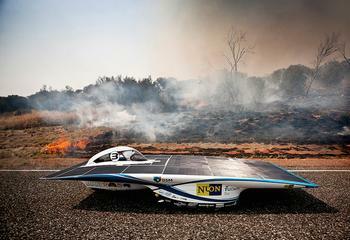 On day three, the batteries exploded in the Team Solar Philippines car, Sikat II. The vehicle was stopped at Tennant Creek, no one was in the car at the time and no one was hurt. The fire brigade arrived to find the smoking car in the desert. But all was not lost. The batteries were replaced, and while the car was somewhat damaged, the Philippines team was back on the road the next morning. The World Solar Challenge is based on the idea that a 1,000 watt car would complete the journey from Darwin to Adelaide in 50 hours, the solar cars are allowed to start the race with just five kilowatt hours of stored energy – 10 percent of that theoretical 1,000 watt figure. All other energy must come from the Sun or be recovered from the kinetic energy of the vehicle itself. Sponsored by Panasonic, the winning Tokai University car cruises at 90 km/h with a top speed of 160 km/h. Because they had to develop solar car technology in a short time, the Tokai team said they used “space grade solar cells” to replace the “single-crystalline-silicon solar cells” used on this solar car previously. The solar car ’09 Tokai Challenger won the 2009 World Solar Challenge, so the developers of this year’s entry said they “kept the design concepts but improved the efficiency with a lighter weight body, a high capacity lithium-ion battery, and a high efficiency motor. From today through Sunday the 23 members of the public can take advantage of the Adelaide GreenZone Drive to test drive some of the world’s lowest emission production cars. The event gives people an opportunity to drive a 3.5 km course through the streets of Adelaide to check out seven low-emission or zero emission vehicles. Audi, BMW, Honda, Mitsubishi, Nissan, Renault and Toyota have contributed vehicles to the GreenZone Drive. 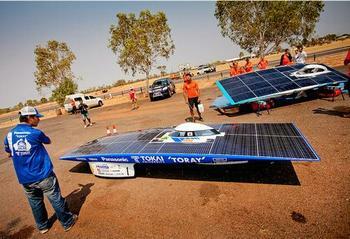 The eco-friendly test drive event is part of the World Solar Challenge. South Australia Motorsport Board chief executive Mark Warren said the drive event is a good way to link the innovative technologies demonstrated by World Solar Challenge cars and production vehicles.